Subsea Dimensional Control surveyor transponders which were swiftly de- tures. Calculations were done on the raw conducted as-built laser scans of the tar- ployed by Loch Shiel using a standard observed data using Sonardyne Connect get structures. 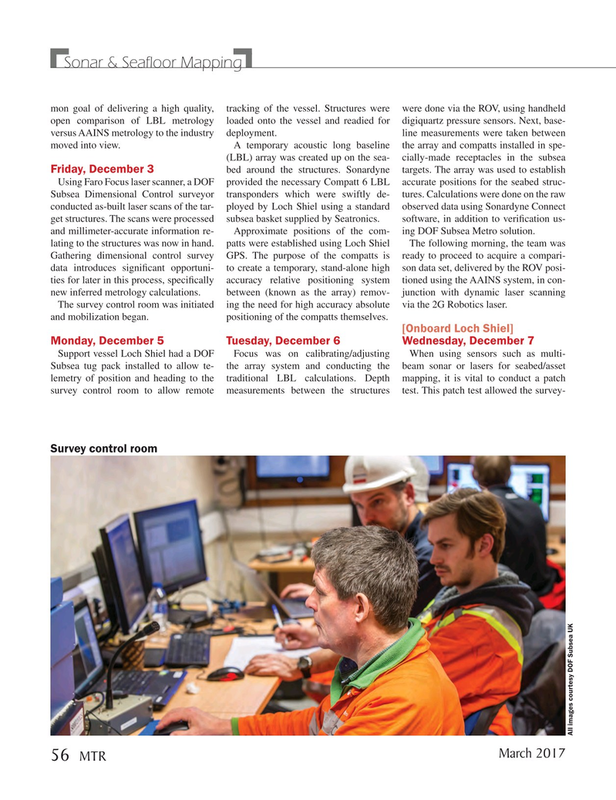 The scans were processed subsea basket supplied by Seatronics. software, in addition to veri? cation us- and millimeter-accurate information re- Approximate positions of the com- ing DOF Subsea Metro solution. The survey control room was initiated ing the need for high accuracy absolute via the 2G Robotics laser. and mobilization began. positioning of the compatts themselves.